A common cause of dry eye syndrome, as explained by the National Eye Institute (NEI) is decreased tear production, known as keratoconjunctivitis sicca (KCS) in clinical terms. This condition is characterized by dryness of the conjunctiva (the membrane that covers the sclera, the white part of the eye, and lines the eyelids) and the cornea (the layer in front of the iris and pupil). 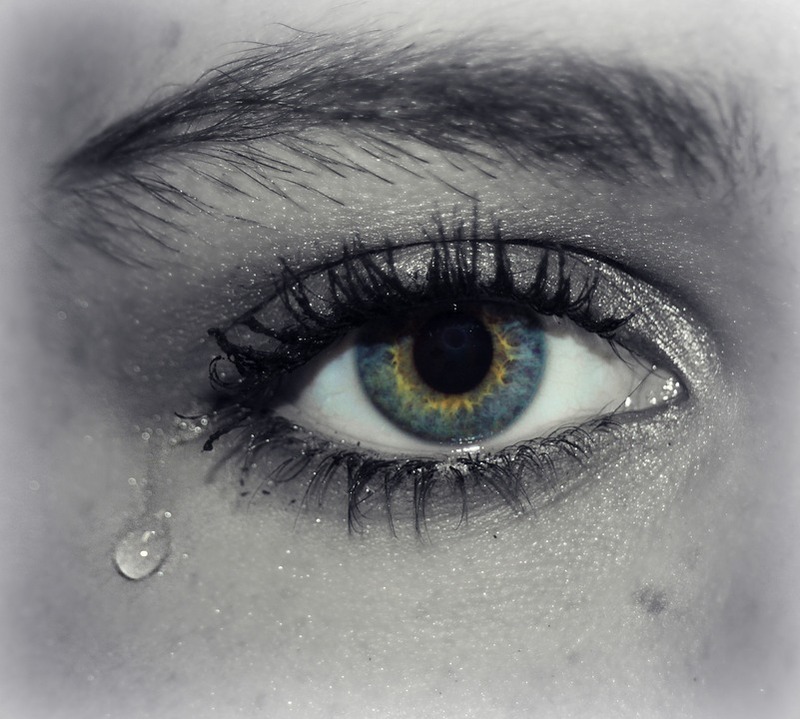 The inability to produce enough tears is usually caused by aging, systemic diseases, medications, and refractive surgery. Diabetes: Diabetic patients commonly experience burning and a foreign body sensation. Additional findings include unsteady tear film production, reduced corneal feeling and decreased lipid layer in the tear film. Other studies show a higher grade of conjunctival squamous metaplasia (change in the epithelium cells to a squamous appearance) and lower goblet density (an epithelial cell that plays a role in maintaining the ocular surface). Rheumatoid arthritis: Although this inflammatory disease primarily affects the joints, it can cause dryness. Rheumatoid arthritis can lead to scleritis, inflammation of the sclera, which eventually results in redness, aching and possible changes in vision. Lupus: This systemic autoimmune disease usually affects different parts of the body, including the eye. Lupus can cause a change in the skin around the eyelids, dryness of the corneal surface, scleritis, changes in the blood vessels in the retina, and damage to the nerves in the eye muscles that control eye movement. Approximately 20% of Lupus patients tend to develop Sjogren’s syndrome, secondary to the autoimmune disease. Sjogren’s Syndrome: Primary Sjogren’s syndrome, like Lupus, affects many parts of the body. Secondary Sjogren’s syndrome affects the eyes, where the glands are inflamed and in turn reduce tear production and result in chronic dryness. 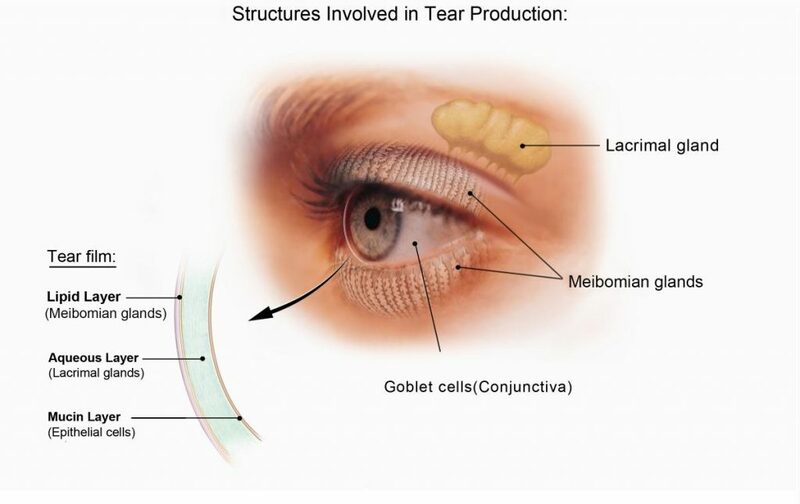 Thin spots of dryness may show in the tear film where tears no longer are able to protect and lubricate. Thyroid Disease: Symptoms of thyroid eye disease may occur in patients who are already aware of their disease, or it may be the first indication that brings the patient to the eye doctor. The main symptoms of thyroid eye disease are bulging eyes, dryness, excessive tearing, redness, double vision, and difficulty closing the eyes (which leads to more dryness). Vitamin A deficiency: Vitamin A assists in protecting the surface of the eye with mucous membrane acting as a barrier against eye infections. As a result, Vitamin A is beneficial for the maintenance of good vision. Vitamin A eye drops have been shown to be effective in the treatment of superior limbic keratoconjunctivitis (SLK), a specific type of inflammation of the eyes; SLK symptoms are usually burning, irritation and redness. Acne medication: This has a drying effect on the oil glands known to irritate the eyes and eyelids. Acne medication is known to decrease overall mucus production and secretion. Antidepressants: These medications block the transmission of nerve impulses which make it difficult to sense dryness of the eyes. Antihistamines: Although they hinder the effect of histamine and provide relief against allergy and cold symptoms, they reduce the watery tear film that lubricates the eyes. The effect of antihistamines is ironic as it can produce eye symptoms similar to that of allergies. Birth control: Due to hormonal changes from the drugs, dry eyes are a common risk taken with birth control. Cholesterol-lowering drugs: Among many other changes in the body, statins have been linked to dry eyes. Decongestants: Like antihistamines, they decrease tear production in the eyes. 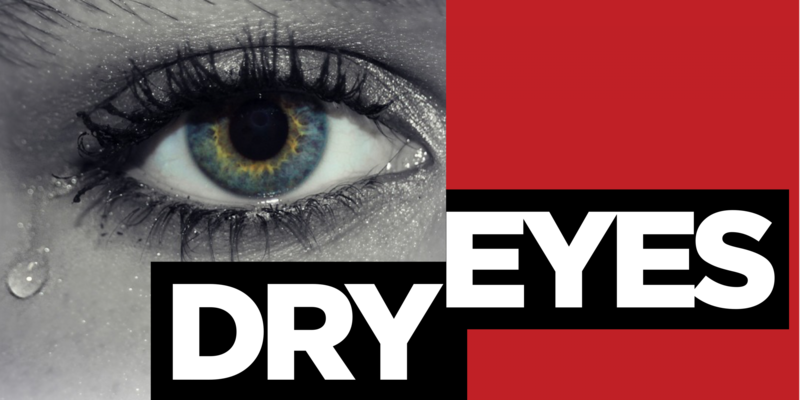 Eye drops: Certain eye drops for red eyes are known to make dry eye symptoms worse. The drops narrow the blood vessels to reduce redness, but when the drops wear off the vessels become larger and more inflamed. Allergy eye drops are also risky, because the patient may not know the true cause of the itchy eyes; the itching may be a symptom from dryness, which doesn’t solve the root of the problem. Diuretics: They reduce the tear production in the eyes and cause dry eye. Hormone replacement therapy: There is a strong correlation of increased risk of dry eye with women taking hormone therapy, due to their hormonal changes; the medication has been known to affect the oil-producing glands and reduce the water layer of the tear film. Hypertension drugs: They are known to decrease sensitivity to the cornea, affecting the stimulus for the lacrimal glands. Parkinson’s disease medication: This medication has the same anticholinergic property as antidepressants and antipsychotic drugs, also known to block the transmission of nerve impulses. PD patients tend to blink only 1-2 time per minute (as opposed to 16-18 times), leading to dryness, irritation and burning. The lists of systemic disease and medications reiterate the importance of eye health, as people tend to forget its important role in the body. Depending on the severity of the dryness, an optometrist or ophthalmologist can determine which type of treatment to take for the patient’s specific needs. Artificial tears: Over-the-counter lubricating eye drops with low viscosity provide quick relief with minimal (temporary) blurring of the vision when applied. Drops with a higher viscosity are usually gel-like and provide longer-lasting lubrication with blurry vision for a few minutes. Restasis: An alternative to the preservatives in OTC artificial tears, this is a prescription eye drop that reduces inflammation. It is crucial to use the drops twice a day for a minimum of 3 months to take full effect of its benefits. Xiidra: A relatively newer vision of Restasis, this is also a prescription eye drop instructed to use twice a day for at least 12 weeks before results can be shown. Punctal plugs: The small sterile plugs get inserted into the lower tear duct to retain the eye’s moisture from draining away too quickly. There are two kinds of punctal plugs: dissolvable ones, or ones that remain in the ducts until they need to be replaced again (from falling out). Warm compresses: This inexpensive way to express the clogged meibomian glands that contain hardened oil glands does not work for everyone. Relief depends on the severity of the tear film reduction and the temperature of the heat from the warm compresses. In fact, this method is discouraging as it is recommended to keep the compresses constant for about ten minutes each time. After a while, people tend to lose this routine. Supplements: Omega-3 fatty acids have been studied to decrease dry eye symptoms, which can be found in fish, flaxseed oil (a vegetarian source), and fish supplements. Water: Drinking more water may help reduce the symptoms of dry eye syndrome. Many internal and external changes in the body and environment play a role in the health of the eye. It is important to regularly visit your primary physician to find out the root of the problem before finding over-the-counter remedies for your eye problems. If your dry eye symptoms persist, it’s crucial to visit your eye doctor. The above-mentioned pointers are for the overall education of the patient to bring awareness of the direct correlation of medicine, disease and dry eye effects. Elvira Derhovsepian is an ophthalmic scribe and optician. She is the creator of the social media platform Overheard Optometry and the author to the first volume which features a collection of its featured stories, now available on Amazon. She enjoys Yelping new restaurants, hiking, writing and editing in her free time.